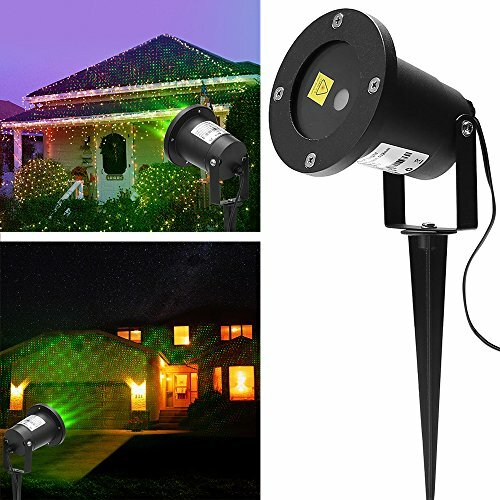 GREEN and RED Lights combinations: providing a magical sparkling lighting, decorating in your garden and wall, take more fun for your party, auto changing and durable without the hassle of string lights. WATERPROOF and QUALITY SAFE: With IP65 waterproof level aluminum case, it can withstand different kinds of whether including sunlight, rainy, and snow. BROAD IRRADIATION DISTANCE: Project 30-50 square meter patterns from 3-15m away, suitable to project on wall, landscape or house. LOW VOLTAGE PRODUCTS: Standard adaptor 12V DC, and 16 feet cable connect with the light, use more flexible. Safety light for your eyes. Energy efficient and longlife. WIDELY USE OCCASIONS: Ideal for Christmas, Halloween, Thanksgiving, party, wedding, concerts, KTV, club, house, trees, pool etc. You could choose to decorate different holidays all year long.